This article is from “The Prayer of the Presence of God.” Click image to preview or order. This is what our Lord meant in that vital passage in the Sermon on the Mount, and what all human considerations on prayer repeat endlessly but without arriving at its full splendor: “But thou, when thou shalt pray, enter into thy chamber and, having shut the door, pray to thy Father in secret.” Enter this sacred chamber of your soul and there, having closed the door, speak to your Father, who sees you in these secret depths, and say to Him, “Our Father, who art in Heaven. . . .” This intimate presence; your faith in Him who is the secret depth of it and gives Himself there; the silence toward all that is not God in order to be all to Him — here is the preparation for prayer. It is obvious that we do not reach such a state of soul without being prepared for it by quite a combination of circumstances. And this is just what we do not know sufficiently in practice. The way to prepare for prayer is by leading a divine life, and prayer, after all, is that divine life. Everything that reproduces God’s image in us; everything that raises us beyond and above created things; every sacrifice that detaches us from them; every aspect of faith that reveals the Creator to us in creatures; every movement of true and disinterested love making us in unison with the Three in One — all this is prayer and prepares us for a still more intimate prayer. All this makes real the divine word of the Sermon on the Mount and the dual movement it recommends: shut the door and pray to thy Father. When He spoke thus, the divine Word showed that He knew our being and its laws. He revealed Himself as our Creator and made Himself our Redeemer. He showed that He made us and that He alone can remake us. The preparation for prayer consists in returning to those depths. Renunciation, detachment, recollection — whatever word we use, the reality is the same, and that reality is the true secret of prayer. Close the door and enter. . . . It needs only these two phrases to explain this, but in reality they are only one thing. They represent a movement, for all that unites us to God is movement. The words are related to two “terms,” or ends. If we speak of the terminus a quo (that is, from), they say (and they do what they say): Close. If we think of the terminus ad quem (that is, to), they say: Enter. We have to close the door on all that is not, and enter into HIM WHO IS. There you have the secret of all prayer. In that spiritual dwelling there is a part still more remote. It is the dwelling-place of being, who communicates Himself and makes us to “be.” We are so accustomed to live turned outward (and objects of sense keep us so turned), we hardly ever open the door of that chamber, and scarcely give it a glance; many die without ever suspecting its existence. Men ask, “Where is God?” God is there — in the depths of their being — and He is there communicating being to them. They are not HIM WHO IS and who gives being to all other things. They receive being; they receive a part of being that does not depend upon themselves. They receive it for a certain time and under certain forms. And from His “beyond” God gives them existence. They exist only by His power and are only what He enables them to be. He is at the source of all they do and, no matter how much they may desire to continue those activities, they cannot do so if He is not there. To understand this, we have to think a great deal, and reflection — perhaps the highest form human act can take — has given place to exterior action and to local movement, both of which are common to animals and matter. The soul that prays enters into this upper room. It places itself in the presence of that Being who gives Himself, and it enters into communication with Him. To communicate means to have something in common and, by this common element, to be made one. We touch, we speak, we open out to one another. Without this “something,” we remain at a distance; we do not “communicate.” God is love. We enter into communication with Him when we love, and in the measure of our love. The soul that loves and that has been introduced by Love into that dwelling-place where Love abides can speak to Him. Prayer is that colloquy. God will not resist that love which asks. He has promised to do the will of those who do His will. It is to love that is due these divine communications which have drawn from those happy recipients the most amazing exclamations. “Lord, stay, I beg you, the torrent of your love. I can bear no more.” The soul, submerged and ravished, has fainted under the weight of these great waters and has asked to be allowed to take breath for an instant, in order the better to renew its welcome. The anchorite in the desert, when he prayed, had to forbear extending his arms, so as not to be rapt in his prayer. St. Mary the Egyptian, St. Francis of Assisi, were raised up from the ground and remained upheld by a power greater than the weight of their body. 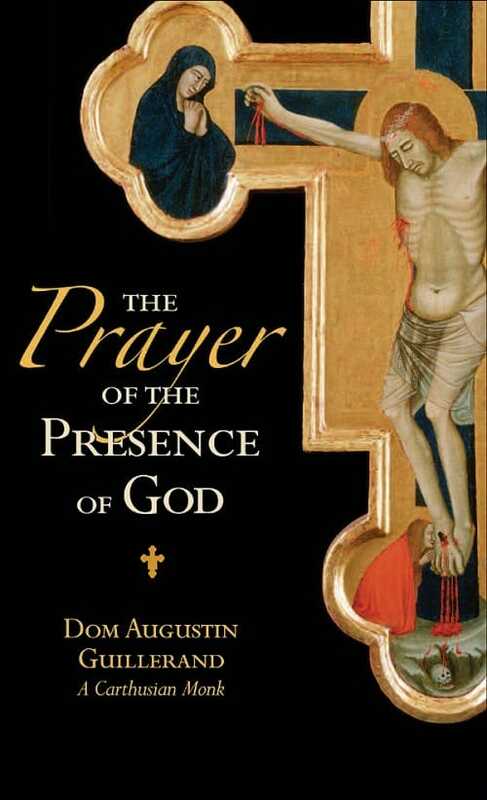 Editor’s note: This article has been excerpted from The Prayer of the Presence God, which is available from Sophia Institute Press. Dom Augustin Guillerand (1877-1945) was a French Carthusian monk who entered La Valsainte monastery in Switzerland in 1916. During the tumults of the 20th Century, Dom Augustin would become famous for his calm and peaceful demeanor and his spiritual teachings. While many of his writings have been lost, we are proud to publish a few here.